Welcome to my Trip Report on Korean Air! 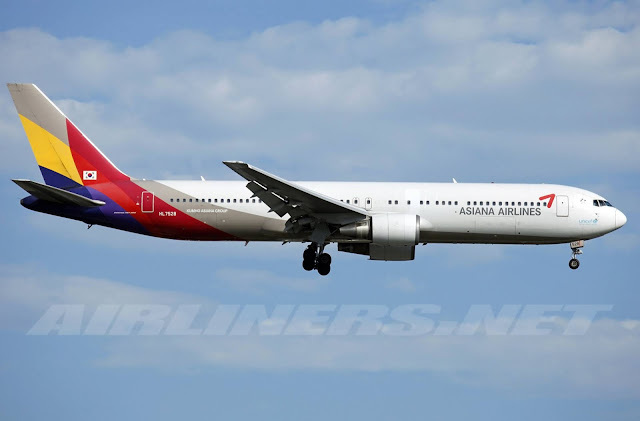 My initial plan was to fly with Asiana Airlines on the GMP (Seoul Gimpo)- CJU (Jeju) route to fly the airline's Boeing 767-300ER before it was retired. The only option for me was to book it via the website because the airline was having internet sales that time and it was not available elsewhere. The 3rd party websites were selling it at least twice the price more while the airline's office in Singapore was not able to sell it at the discount price offered on the website. I have picked the flights, one way Boeing 767-300ER and the return on the Airbus A330-300 but no matter how many times I tried, on different days and timings, the payment page refused to accept my cards (I tried a few), so eventually I gave up and decided to turn to Korean Air to see if there is anything interesting. Photos are credited to the respective airliners.net photographers. I noticed a change in Korean Air's website and it's different from the old version, much better than the previous in fact. Looking at the mobile version, the airline has also made changes to it and perhaps I should give it a try to book a one-way flight with this airline and the return flight with another airline. Using the desktop website to check on the aircraft, something caught my eye! The previous year I flew on GMP-CJU with this airline, the Boeing 777-200ER and Airbus A330-300 weren't operated on this routing, it was mostly Boeing 747-400 that did the job. This time round, fewer Boeing 747-400 flights and a daily Airbus A330 and Boeing 777-200ER while the rest were operated by either Boeing 737-800 or -900. After checking the flights, I decided to fly on the Boeing 777-200ER which was operating on KE1221 flight, ironically this was the same flight that I flew the first time with this airline, on the airline's Boeing 747-400 HL7493, you can check out the trip report over here. Once that was decided, I used the mobile app (IOS) to make the booking and it was flawless. Easy to use and no issue at all. 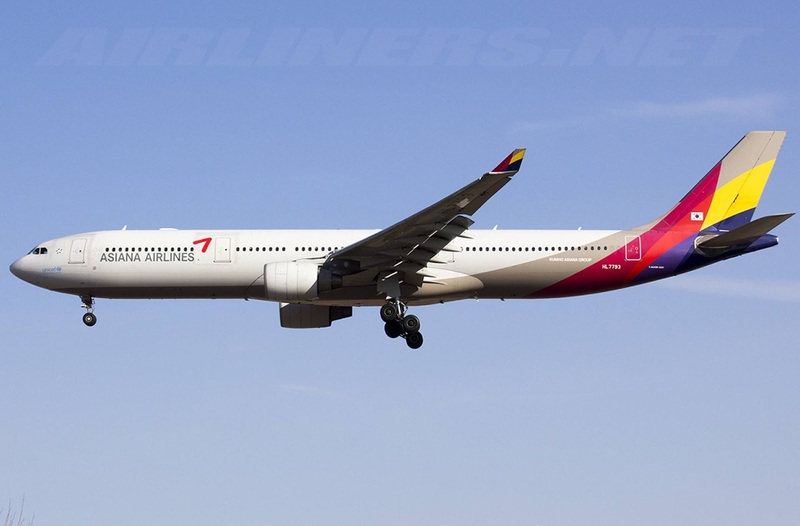 This airfare isn't cheap, it was around 20,000 won more expensive than the discounted price Asiana Air was offering. I decided to stick to it and that provided the mobile site doesn't give me trouble. If it does, I would have probably looked at something else. No 3rd party software was needed to make the payment, thumbs up for the airline! After making the payment, I received this notification below. It was a stress-free experience this time unlike my previous experience booking with this airline. Choosing the seats, I had no issue at all. The only thing I worried about is an equipment change and looking at Flightradar24, the Boeing 737-900 operated a few times on this flight. An aircraft type which I had not flown before but I didn't want as I had already redeemed miles on GMP-PUS to fly on the Boeing 737-900 and also to visit Busan. Plenty of seats available, I thought the flight would be empty on that day, I was so wrong that day. Using the desktop to check my booking, no issue at all. Noticed that the airline has the 'no window' indicator, that's pretty helpful. I have seen many disappointed passengers coming to their seat to find that that they had no window. For those who wondering why? Its because inside the panel contains of wires that connects electric power to your IFE seats and other parts of the aircraft. Once that was done, I concentrated on other bookings. Here are some photos from my hotel to the airport! Great weather for flying, right? The temperature was around 10 degrees. Making my way to the domestic terminal. The walkway is finally opened and it looks very nice. Before I checked in at Korean Air counter, I did something that I wanted to do from the beginning and that was to purchase a return day ticket on Jin Air. Most of the flights were full for that week, luckily I managed to get seats on Saturday, one way Boeing 737-800 and the return on the Boeing 777-200ER. However, I had to pay S$200 which was quite steep for a Low Cost Carrier. This paper is also used for boarding pass. This was where I headed to after that, waited for about a few minutes before checking in. 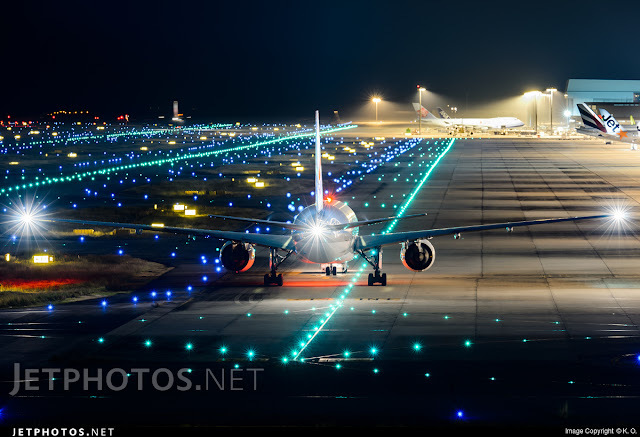 For domestic flights, its better to sign up for the airline in order to take advantage of its low fare if there is. Finally, I would be flying on this airline a few days after this flight. The process went smoothly, the staff was nice and her English was acceptable. After that, I decided to have Korean Fast food - Lotteria which served delicious Korean burgers, you have to try. After enjoying the burger, I headed to the airside to check out my aircraft. See the number of flights heading to Jeju? You must be wondering how do these airlines fill up the seats!! Odd numbers - Planes are connected to the aero-bridge. Even numbers - Planes are parked at remote parking lot which means you have to take a bus over. My flight was at Gate 3 which makes photography easier for me. My aircraft - HL7750 was towed in. I was hoping for the Skyteam Livery, better luck next time! What a beauty, isn't she? The updated titles on the aircraft certainly looks nicer than the previous. This would be my 2nd time flying on KE1221 flight, my first time was on the Boeing 747-400 flight. Thinking that the flight would be empty, I decided to skip my row and moved to a few rows behind. I realised that row was too close to the purser so in case if I want to take photographs or videos, I won't be stopped. Later on I realised that electronic devices such as Ipad and Iphone are allowed to be used, that's provided that the flight mode was on. This applies to all Korean carriers, great news, right? The numbers of passengers kept flowing in and I was getting worried. True enough, this seat I was on was taken and I moved to a few rows behind and the same thing happened, so I gave up and moved to my original seat which was occupied, but the nice Korean couple moved to their original seat and I had finally settled down. Its like playing the magical chair! The crew and a few others must be wondering what is going on with this guy! Once the door was closed and armed, I took a look around and it seems that the flight was full! I think most of them were transit passengers and there were a fair number of Singaporeans and PRCs on board. Their accent gave it away. Fortunately, they were well behaved and we had no issue apart from some seating issue among themselves. (who is sitting at where and all that). Unlike my previous domestic flight, this time we were using 14L instead of 32R for departure, so taxi to the runway took some time. Here are some of the cabin shots taken. In fact if you compare this to the business class seats (on the left), it looks similar. What do you think of the premium classes? If these aircraft are deployed on regional routes, I am fine with them. If its to Europe or U.S, I think I would be disappointed especially with the competitors offering better products than this. I love the Korean crew, always so friendly and helpful! Scoot's crew: Please learn from them! The Economy Class seats are in a comfortable 3-3-3 layout and they are suitable for long haul flights. Yes, it may be outdated but its comfortable for me although I would pick the emergency row or the rows near the rear for better leg room space. Decent IFE system - its touch screen and is responsive. IFE box that can eat up a bit of your legroom space! Drink holder, you don't have to open your tray to use it! That's what I like. The seat cover, there should be a Korean Air logo on it. My entertainment for the short flight. I am now a fan of Korean Air! Adding another Boeing 777-200ER ride to my flight logbook is definitely satisfying, its a good aircraft and one of the most popular aircraft among the airlines. Its comfortable, fast and stable which is what I like about this photogenic aircraft. It didn't seem long ago that airlines were taking delivery of them, sadly now some have begun retiring them in return for more efficient aircraft such as the Airbus A350XWB and the Boeing 787 Dreamliner. Safety card - I got to say Korean Air has the nicest safety cards. Vomit bag and Skyshop pre-order form. Only applies on medium-long haul flights! No point using this on a 45 minutes flight, it doesn't make sense. As this was a short flight, only a choice of drink was offered. Water, tea or juice, I chose the latter - orange juice. The cabin crew on my flight were professional and courteous. They greeted every one of us while we boarded and even bowed to us. The high standard of Korean service kicked in from the start till the end and I am impressed with them even for a short flight like this. The flight went passed quickly. It was smooth for most parts of it with occasional bumps but the flight crew did not take any chances, the seat belt sign was turned on before descending and it didn't turn off until the aircraft reached the gate. Similarly to the Taiwanese flight crew, they are pretty cautious about turbulence. Seat belt signs will turn on quickly even if the bumps are light ones or strong bumps but for a short while. Since the flight was short, I didn't bothered with the IFE system, only played it for a while to see how user-friendly it is. It's fine even though the content is limited. This was my entertainment - the window view. I was to fly Jin Air's Boeing 777-200ER, HL7743 a few days after this flight. Most of the windows on my aircraft were badly stretched. After a fairly long taxi, we were on runway 14L for departure. Rolling down the runway with the noisy Pratt and Whitney Engines doing its job. We quickly lifted off and get to enjoy the view of Seoul. We started our descend when we flew across water. Speed brake was deployed and we were soon on final approach towards the single runway airport, Jeju. 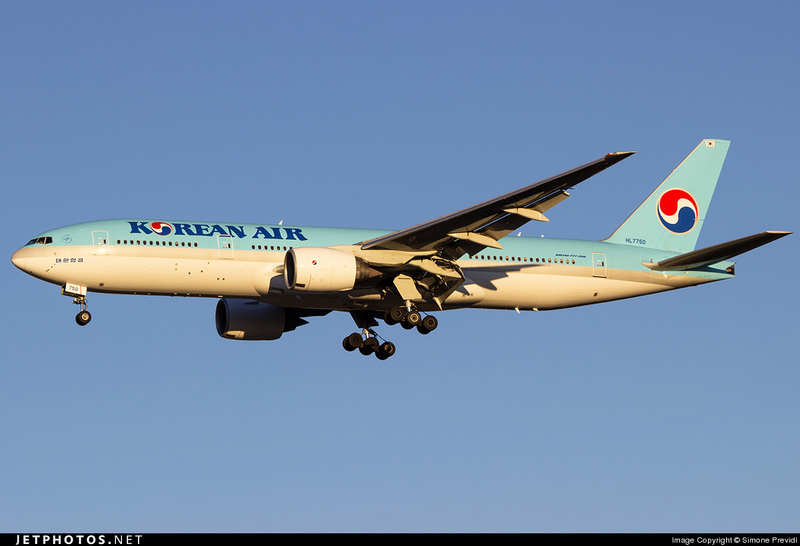 There we go, my flight with Korean Air's Boeing 777-200ER has come to an end. This aircraft was to fly back to Gimpo and then onwards to Tokyo Haneda later that day. Here are the videos of the landing and take-off. Another great experience with Korean Air even on a short flight like this, flying on a wide-body on such as short sector may not be exciting but at least I got it off my list. To be honest, I was surprised about the load on this sector since the last time I flew on the same flight, it was less than 30% in Y class. Neverthless, I enjoyed the flight and the Korean service. Paying more to get a taste of Korean Air may be worth it. This airline has improved its safety record ever since Delta Airlines came in to help out, so don't look at its history and you can be assured that this airline is a lot different and safer than before. this aircraft may not have the best in-flight products, but its comfortable for short-medium haul routes.